Three things seem to confuse the body of believers when it comes to the Holy Spirit (Hebrew: Ruach Kodesh). The first is the notion promulgated by the church that the outpouring of the Holy Spirit on Shavuot (Pentecost) inaugurated the ‘church age.’ The second thing is the belief that the baptism of the Holy Spirit occurs upon the confession of faith in Jesus (Yeshua) and the indwelling Holy Spirit arrives when we are baptized and He is “invited into our heart.” And the third thing is that the Holy Spirit is one of three ‘persons’ that make up the Trinity. Each of these doctrines requires further study. This series will attempt to find Biblical evidence to uphold or reject these doctrines. Why is the Holy Spirit such a source of confusion and why is it no one seems to discuss it? Mark 3:22-30 states, “And the scribes who came down from Jerusalem said, ‘He has Beelzebub,’ and, ‘By the ruler of the demons He casts out demons.’ …‘Assuredly, I [Jesus] say to you, all sins will be forgiven the sons of men, and whatever blasphemies they may utter; but he who blasphemes against the Holy Spirit never has forgiveness, but is subject to eternal condemnation;’ because they said, ‘He has an unclean spirit’” (NKJV note: The Pharisees made the same charge in Mat 9:34.). Okay then. This is serious and scary to contemplate a sin that will not be forgiven! Maybe that is why no one seems ready to challenge anyone who claims to have heard from the Holy Spirit, or who speaks in ‘tongues,’ or causes people to be ‘slain in the spirit,’ or makes prophetic statements claiming the Holy Spirit. After all, if it truly IS the Holy Spirit that animates any of these things, speaking against it is a ticket to ‘eternal condemnation!’ Isn’t it? The only definitions I have for truth are found in the Bible. Presumably, those of you who are reading this article are ready to accept that what the Bible says is true. If not, I don’t know what to tell you. I will use the Bible to help with this investigation and search for the Holy Spirit, because I believe the Bible is true. Gen_1:2 The earth was without form and void, and darkness was over the face of the deep. And the Spirit (ruach) of God was hovering over the face of the waters. Well, that certainly narrows it down, doesn’t it? Maybe if we look up holy it will help. Let’s stipulate that the ‘Holy Spirit’ is ‘God’s Spirit.’ There may be other spirits out there, but the spirit that we are most concerned with is His Holy Spirit. It is the same spirit that hovered over the face of the waters at creation, is the same spirit that Yeshua promised as a gift to his disciples. I even believe that His spirit is with us today! But, how do we identify that spirit? Does everyone receive the same portion of the spirit, or does it manifest in different ways to different people? Is it a constant companion to every believer? Is Acts Chapter Two the first time the Holy Spirit makes an appearance to men in the Bible? Even if you don’t want to consider the Old Testament writings, the New Testament says that Yochanan the Immerser (John the Baptist, son of Zechariah) was filled with the spirit. Luk 1:13- 15 But the angel told him, “Stop being afraid, Zechariah, because your prayer has been heard. Your wife Elizabeth will bear you a son, and you are to name him John. You will have great joy, and many people will rejoice at his birth because he will be great in the Lord’s presence. He will never drink wine or any strong drink, and he will be filled with the Holy Spirit even before he is born. And Peter received revelation directly from the Father and Yeshua called him blessed! Mat 16:17 And Jesus answered and said to him, Blessed are you, Simon Barjona: for flesh and blood has not revealed it to you, but my Father which is in heaven. Yet, just a few verses later we read this! Yikes! From being blessed with divine revelation by the Spirit of YHVH to being called Satan! John 3:34 The one (Yeshua) whom God sent speaks the words of God, because God does not give the Spirit in limited measure to him. John 3:35 The Father loves the Son and has put everything in his hands. This fairly leaped off the page at me this morning. To say that Yeshua received a full measure of the Spirit from the Father suggests that the Spirit may be dispensed to others in a ‘limited’ fashion. That is really comforting to me because I don’t think I have ever had the same kind of experience with the Holy Spirit that others have claimed. Num 11:16 Then the LORD told Moses, “Gather together for me 70 men who are elders of Israel, men whom you know to be elders of the people and officers over them. Then bring them to the Tent of Meeting and let them stand there with you. Num 11:17 Then I’ll come down and speak with you. I’ll take some of the spirit that rests on you and apportion it among them, so that they may help you bear the burden of the people. That way, you won’t bear it by yourself. This all happened before the outpouring that is described in Acts Chapter Two. I have heard it explained that the event on Shavuot (Pentecost/Acts 2) was different because it made the Holy Spirit accessible to ‘everybody.’ Is this true? Weren’t the disciples the only ones who were touched by the rushing wind and flames of fire as described in our Bible? Did the rest of the pilgrims that came to the Feast receive the same unction, or was it a limited, albeit profoundly miraculous, event that was given as a gift to his disciples? WHAT ABOUT ACTS CHAPTER TWO? 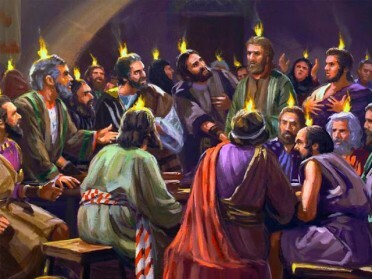 Act 2:1 When the day of Pentecost arrived, they were all together in one place. Act 2:2 And suddenly there came from heaven a sound like a mighty rushing wind, and it filled the entire house where they were sitting. Act 2:3 And divided tongues as of fire appeared to them and rested on each one of them. Wow! This spectacular event has been used as the miraculous birth of the ‘new-testament’ church. I learned there was no church before this event, and no one before the disciples was ever filled with the Holy Spirit. I have already shown that the Spirit was dispensed prior to this event! It was certainly special and spectacular, but it wasn’t the first time the Holy Spirit was shared with men! So, how are we to understand if we ‘have’ the Holy Spirit? This is where our western Gentile church has not served us well. There is a sense among the church believers that the Holy Spirit is dispensed to everyone just like it was to the disciples in Acts Chapter Two. There is an almost Svengali-esque mysticism attached to the Holy Spirit. I have friends who believe that they are no longer able to sin because the Holy Spirit will guide them! Really? All our free will is usurped by the Holy Spirit? If that were true, we should expect to see a lot less apostasy and ‘men of faith’ falling into adulterous affairs and the like! Shouldn’t we? The disciples were gathered with the pilgrims from diverse places (see Acts 2:5-11) when the outpouring of the Holy Spirit happened. Would that be possible in a small ‘upper room?’ What House were they in? There are no idle words in the Bible. And, even more important, there are no idle Feast days! Shavuot is the anniversary and an echo of an earlier event. Shavuot is when the Torah (Commandments/Law) was handed to Moses on Mt. Sinai! It was given with thundering, fire, and all the people in the mixed multitude heard the commandments in their own language! Now that we understand that, we can place this event in its proper context! The ‘upper room’ is NOT where the disciples were when the outpouring of the Holy Spirit happened. They were on the Temple Mount (the “House”) along with the mixed multitude (just like those with Moses at Mt. Sinai) when the people heard the words spoken in their own languages! The rushing mighty wind and flames of fire are similar in every way to the Mt. Sinai event which all followers of the Scriptures would have recognized. Furthermore, it would have been an easy thing to baptize (mikveh) three thousand believers since the Temple mount has hundreds of mikveh pools for this express purpose! Most important of all, the disciples were speaking the SAME MESSAGE, but it was understood by all of the nations in their native language! That’s the miracle! The Message, not the means by which it was delivered! The message that drew the listeners to the Father! How are we to understand this event? Act 2:6 And at this sound the multitude came together, and they were bewildered, because each one was hearing them speak in his own language. Act 2:7 And they were amazed and astonished, saying, “Are not all these who are speaking Galileans? Act 2:8 And how is it that we hear, each of us in his own native language? Think about this. It seems impossible that there was a cacophony of different languages being spoken at the same time. The text really doesn’t say how this all transpired. I always thought that every disciple was suddenly speaking in a non-native language, or they were speaking gibberish (sometimes called tongues) that the crowd was able to interpret in their own language. Who were being mocked? The disciples? Or the ones astonished at hearing in their own language? Who was doing the mocking? Might the mockers have been those who did not hear anything out of the ordinary and didn’t understand the amazement expressed by those who did hear the miracle when they did not? Who had ears to hear? Obviously this is speculation. However, the Almighty is not a God of confusion. How could all of the many ‘Jews and proselytes’ discern their own language and hear what was being said if everything was being spoken simultaneously in a myriad of different languages? It would have been chaos! It is easier to believe that the disciples were speaking the same message and it was received (heard) by the crowd in their own native tongue. That would have been an amazing thing, especially when men standing side by side in the crowd could not communicate with each other but could suddenly hear and understand every word spoken by the disciples! Whatever the actual facts of the miracle, what is lost in this ‘speaking in tongues’ doctrine is the content of what the disciples were sharing with the crowd! Shouldn’t we care more for what was being said than how the message was delivered? Were they telling them the gospel of the Kingdom…the same gospel that they had been tasked to preach by Yeshua himself? Or might they have been speaking the terms of the covenant with the Father that was made with the Israelites at Mt. Sinai? It was the anniversary of that event, and the outpouring of the Holy Spirit was the refreshing of that agreement. How much clearer could He have been than to have the disciples speak the Commandments just as were heard at Mt. Sinai? The covenant has never changed! How better to re-confirm His covenant with us than to perform a miracle that takes us back to the original Mt. Sinai covenant event? So, how are we to understand the miracle of Shavuot? Do we see believers today walking with flames on their heads and speaking in tongues? For that matter, do we see the kinds of miracles that the disciples performed in the Book of the Acts of the Apostles? Can we challenge the notion that a confession of faith leads to the indwelling Holy Spirit and renders all believers incapable of sin? Perhaps we are being presumptuous if we take upon ourselves the gift that was promised to Yeshua’s disciples. Was this a unique event or a pre-cursor to a ‘new’ age? How dare we accept for ourselves what may not have been promised to us, or what may be promised but in limited and selective ways? The following is from Tyler Dawn Rosenquist. If we understand that the outpouring of the Holy Spirit documented in Acts Chapter Two is a replay of Mt. Sinai, why is it that the ‘church’ has made it out to be a singular event that was done to usher in a whole new doctrine and a new religion called Christianity? We see a few very specific things tied together. Yeshua reminds them of things spoken personally, to them, the eleven. Yeshua promises that the Spirit will teach them personally all things (that the Spirit will do away with their confusion in the wake of what is about to happen, preparing them to go forth with the Gospel). Yeshua promises that the Spirit will cause them to remember what Yeshua spoke personally to them, as a way of bringing about #2. Does the Holy Spirit speak to us? What does it mean to be filled with the Holy Spirit? I confess to having a hard time understanding this state of being. I believe I have had ‘impressions’ or insight provided at times, but I am a skeptic when it comes to those who say they have the Holy Spirit inside them while participating in things described as abominable in the Scriptures. I have been sure I need to write this article, but I have been struggling and asking for guidance on how to proceed. Last night I dreamed “Psalms 186.” First of all, it is rare for me to remember my dreams, much less a specific thing, but, I roused up three times, and each time I was ‘reminded’ of this verse. I saw it clearly written. I knew I had to find what it meant this morning. Is this evidence of the Holy Spirit? I believe it is. I have taken comfort that He hears my voice. Am I still frustrated that I didn’t get an answer for what troubles me? Yes and no. Yes, MY choice would be for a direct and clear answer to what I want, but, I am learning that I need to be humble and wait on Him. It is all about trust. I am resting on His promise that if we Seek we will find Him. When it is needed, He will send his gift of the Holy Spirit. The same Spirit that hovered over the waters at creation, the Spirit that spoke the Commandments at Mt. Sinai, and the Spirit that called the believers to repentance on a certain Shavuot following the crucifixion. The same Spirit that let me hear the true gospel of the kingdom and begin this walk of Torah-obedience. Could a verse remembered in a dream be from Him? Is He most evident in the ‘still small voice’ that reminds us of His Word? Yochanan the Immerser told us that we are among those ‘the Lord our God calls to himself.’ At Shavuot He used the Holy Spirit to call out to those with ears to hear. That is the baptism of the Holy Spirit. The next article will further explore this gift of the Holy Spirit. Hello Brother! I really enjoyed your blog. I also enjoyed your evangelistic outreaches. Keep up the good work. I also have been working on creating a hebraic evangelistic approach. I love how you go, being led by the Spirit. I would love to share with you the approach, I feel YHVH lead me to outline sometime. 18 And they will go there, and they will take away all its detestable things and all its abominations from there. 19 Then I will give them one heart, and I will put a new spirit within [a]them, and take the stony heart out of their flesh, and give them a heart of flesh, 20 that they may walk in My statutes and keep My judgments and do them; and they shall be My people, and I will be their God. So really one of the main reasons for the Holy Spirit is to cause us to have a heart to Love God and by Loving God we will WANT to be obedient to his word!!! Do you baptize in the name of Jesus or in the name of the “,Father ,Son and Holy Spirit”? My heart was full of sorrow, my husband was just beaten up this week end and I read this article looking for comfort form YESHUA’S word it gave me hope and lightened my burden and I thank all the writers the comforter is truly with us even though in our human state we sometimes cannot see. At last! Someone writes common sense explanations about The Holy Spirit, referencing Genesis. When is the next article coming out? Thank you so much for this, I thought it was just me who found it difficult to buy into all the mystical hysteria, so happy to read what you have written.